The Hyatt Residence Club Maui is the flagship resort within the Hyatt Residence Club portfolio. The resort is a vacation ownership property (timeshare) featuring one, two and three-bedroom villas with expansive lanais, spectacular ocean views, full gourmet kitchens and luxurious master baths. For an in-depth review of the property, check out my detailed review of the Hyatt Residence Club Maui. All units are direct ocean front with expansive views of Kaanapali Beach and the ocean. There are nine one-bedroom units with a mountain view on the back-side of the building. This review will focus on the three-bedroom units. 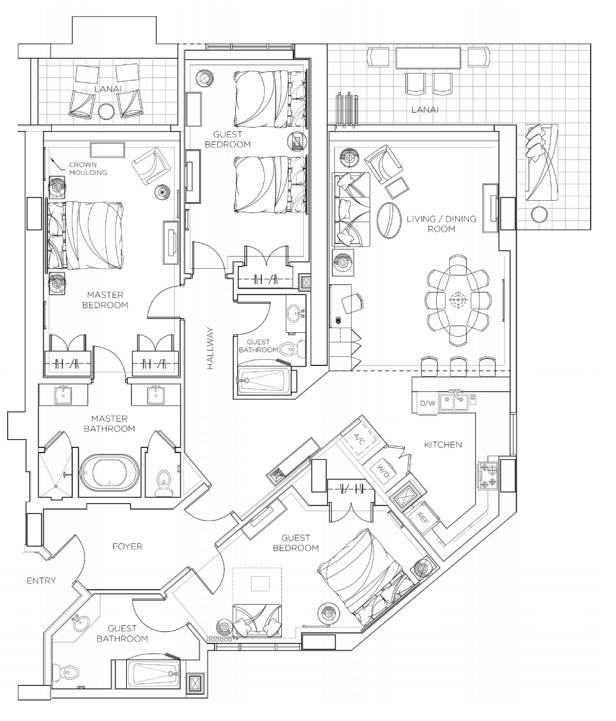 The floorplan of the unit is shown below. The first thing you'll notice is that this is not a hotel room and is more like a condominium or apartment, showcasing resort residence living at its finest. The three-bedroom units offer 2,054 to 2,111 square feet of space for up to eight guests. All of the three bedroom villas offer a master bedroom and second bedroom with king size beds and two queen beds in the third bedroom and queen size sleeper sofa in the living room area. The villas also have nicely appointed kitchens, a washer/dryer and outdoor lanai spaces to enjoy the ocean, beach and pool views. This resort is perfect for family vacations or large groups, as you have more space than a typical hotel room. It's also great as you can save money on food costs instead of eating out for every meal with the gourmet kitchen. 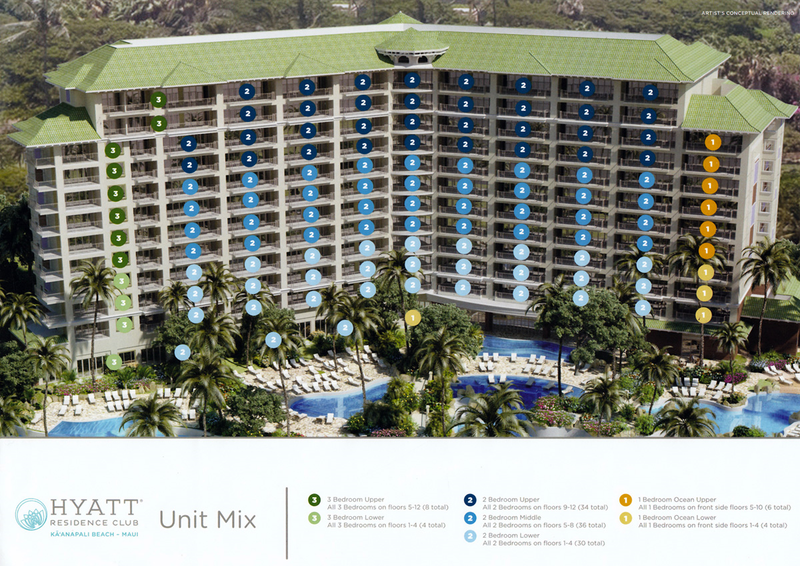 For comparison, a similar type of accommodation next door at the Hyatt Regency Maui would be a very large hotel suite, which still wouldn't have a full kitchen, an in-room washer/dryer or the expansive outdoor lanai area as featured at the Hyatt Residence Club Maui. The first thing you'll notice when walking in to the villa is the front foyer entryway with hallways leading to the living room and kitchen area and separate hallway leading to the master and third bedrooms. The living room area offers a lot of space with a sitting area, dining room and access to the wrap-around lanai. The gourmet kitchen offers granite countertops, stainless steel Bosch appliances, custom wood cabinetry, and a full assortment of high quality dinnerware and cutlery. The master bedroom features Hyatt’s signature king size Grand Bed and features outstanding oceanfront views with a separate lanai. The luxurious master bath features a walk-in shower, separate vanities, and an elegant free-standing tub. The second guestroom features a king size bed and sofa sleeper. The second bathroom is also off of this bedroom. The third bedroom features two queen size beds and is next to the third standard bathroom. The second lanai off of the living room area offers stunning ocean, beach and pool views and wraps around the side in an L shape, perfect for catching gorgeous Maui sunsets. Each unit features a stacking washer and dryer, perfect for cleaning all of your beach wear. The Hyatt Residence Club Maui is a top-notch resort on Kaanapali beach surrounded by forty lush tropical acres and boasts two pools, the Pau Huaka’i Tiki Bar, a locally-sourced gourmet deli and grocery, and a fitness center. The property shares amenities with the Hyatt Regency Maui next door including pool access for two additional pools, kids pool area and waterslide, seven dining options, spa, concierge, activities and room charging ability. Valet parking is also provided complimentary at the resort. The Hyatt Residence Club's newest location on Kaanapali Beach is a prime example of what vacation ownership can offer and is perfect for families. The one thing I will say about the price, is that it should be comparable to a lifetime of vacations and if you do the math, you might conclude they aren't so bad, depending on the location and the company offering it. Timeshares should never be viewed as investments, as purchase prices and yearly fees can add up fast, but they should be viewed more as a vacation lifestyle. Like I discussed in my previous post about timeshares, vacation ownership programs aren't for everyone and in lots of cases the arguments against them can outweigh the benefits one could have from them. But if you've done your research and believe you can benefit from timeshare ownership, there can be a lot to love about them. I detailed the pros and cons of timeshares in a previous post here. If you're interested in learning more about the Hyatt Residence Club Maui, check out their website for the latest offer. For readers of The Family Travel Guy, there may be a special targeted offer available for a 6 day/5-night stay at either the Hyatt Residence Club Maui or the Hyatt Regency Maui hotel. Note that a 90-minute sales presentation is required and the offer is dependent on availability and minimum qualifications. If you're interested in learning more, send me a message and I can share more details.